Within a small-little church situated in the middle of nowhere, a sermonizing preacher is chased out of his pulpit by an unknown assailant. The preacher eventually manages to escape from his predicament with the aide of a jovial young-buck driving a car nearby. The preacher is called the Thunderbolt (Clint Eastwood), the young-buck is called Lightfoot (Jeff Bridges),&;and together, they drift off into the distance, getting to know each other along the way. 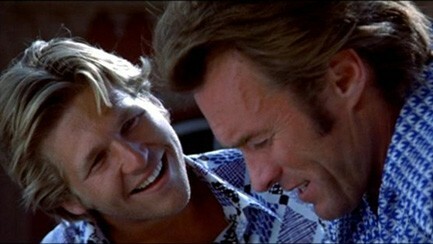 For example, Thunderbolt discovers that Lightfoot is a rather randy chap at times. Whilst Lightfoot, discovers that Thunderbolt was once a member of a gang of thieves. Yep - that's correct - this 'man of the cloth' was previously a 'bank-robber', whom is now hiding from his prior partners in crime, because they believe that he double-crossed them with the monies from said robbery. And did Thunderbolt do this? No - of course not - he hid the loot in one-room schoolhouse in Warsaw, Montana - a building that does not currently exist. Moreover, two of Thunderbolts his ex-cronies, Red Leary and Eddie Goody (George Kennedy and Geoffrey Lewis), catch up to him and Lightfoot, not so long after this revelation is revealed. Bad news, right? No – surprisingly not. Because the very next day this 'motley crew' drives down to the city where this robbery took place, and they then decide to commit this robbery again. But before they do this: Lightfoot surveys the area as a gardener – Thunderbolt works in a ore refinery to acquire a metal gun cannon need for the task ahead – Goody is a mobile ice-cream man who provides transportation – and Red acts as a facilitator between the other three, whist night-cleaning in a department store nearby. Well, I suppose that is why what next transpires is a somewhat strained affair all in all. As plans are put in motion - ploys derive from a strange notion - a villain gives in to their baser emotion - and a discovery comes about with a wayward devotion. 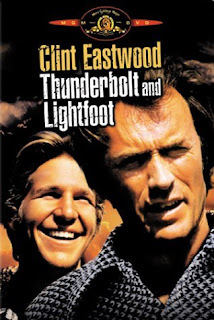 In my own most humble opinion, 'Thunderbolt and Lightfoot' is a film with a difference, and that difference is all to do with how the story is told, and what manner it was conveyed in. Well, just think about it for a moment or two, how many ‘bank heist’ films have you watched, where the villains of the piece have to take a day jobs first, just to earn enough money to commit the crime? Also, I am sure that you have not seen that many ‘heist films' where a vicar is chased from his church by an armed assailant either? No – and that’s what I like about this film – it’s different. Also, in addition to this, this flick is different in its temperament too. For example, the main protagonist of this film - the Clint and the Jeff characters - come across somewhat laid back and relaxed in their demeanor; and just tale life as it comes. You don’t hear many ‘bad-luck stories’ to justify who they are and what they do! They’re comfortable in being themselves – and I find that rather refreshing for a movie. Though, to juxtapose this temperament, are their pseudo-accomplices - the Geoffrey and the George characters - both of whom have a rather strange quirk about their person. With Geoffrey, it’s his tepidness – with George, it’s his anger – and together, they seem to balance out the whole gang perfectly. Overall, I have to say that 'Thunderbolt and Lightfoot 'is somewhat perfect film. It has a nice story-line – a very catchy film-score – and a cast of movie veterans playing at the top of their game.